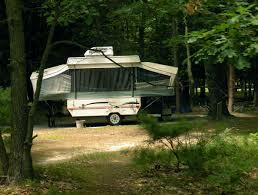 Big Sandy Camp and Retreat Center has a variety of lodging options. 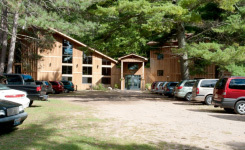 Lakeview Lodge has 133 beds; 14 full size and 119 twin size. Each room has several bunks. There are shared men's and women's bathroom facilities. Lakeview Lodge also houses our dining hall and chapel on ground floor. Oak Lodge has 72 beds, 6 full size and 66 twin size. There is one speaker's room with private facilities; the other bunk rooms share men's and women's bathroom facilities. Oak has a cozy lounge with a stone fireplace, a snack counter with a refrigerator and microwave, a conference room that seats up to 70 persons. 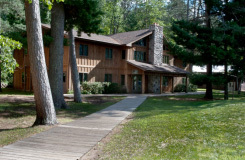 Birch Lodge is attached to Fisher Chapel which can seat up to approximately 375 people. Birch has 96 beds, 16 full size and 80 twin size, and a private bath in each room. Birch Lodge also has an elevator which services all three floors. Loon Lodge has 27 beds, 26 full size and 1 twin size. Two rooms have private ¾ baths, the remainder use shared facilities. Loon has a lounge with a fireplace for cozy study groups and a more intimate setting. It also has a refrigerator, microwave and snack counter. Loon works well for small groups and couples. 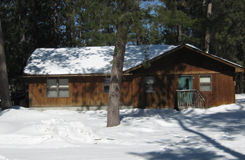 The Pine Needle Lodge is one of our smaller buildings and offers a very cozy atmosphere. 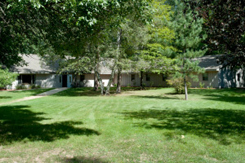 The lake-side has just recently been remodeled and is completely self-contained with private bath and complete kitchen. The lake side has two bedrooms and a total of six beds (one double). It is also home to our camp nurse during the summer camp weeks.